Who else likes Chipotle as much as our family? 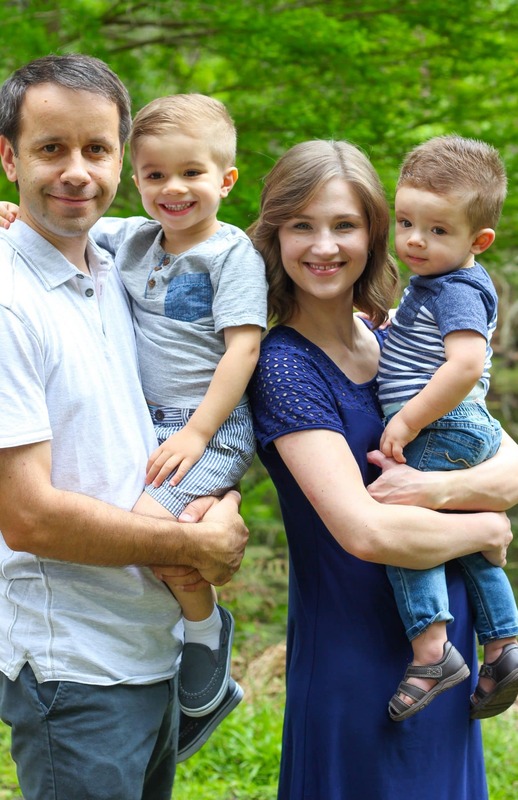 Sergi and I will often stop by for lunch on the weekend when we’re out shopping, exploring the city, stopping by farmer’s markets or on our way to the beach. 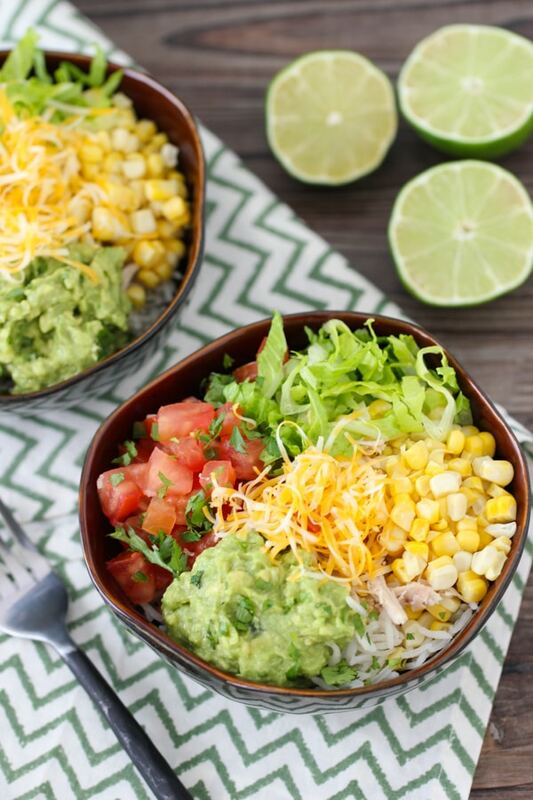 Their burrito bowls are our favorite! Today I have the homemade recipe for you along with our Guacamole recipe, which we use all the time for many different meals. A few weekends ago, my beautiful niece, Madeline, turned one and we all got together to celebrate her birthday. My parents, my sister, Karina and her husband, Edward, happened to be visiting us in Florida at that time, so we had a great time with our family and my sister-in-law’s family, celebrating this sweet girl. It’s so hard to believe that she’s already one. It seems like it was just yesterday when we came to visit Mark and Marina in the hospital and met their newborn princess. How corny of me to say so, but it really is true. Marina set everything up so beautifully and the food was really delicious. 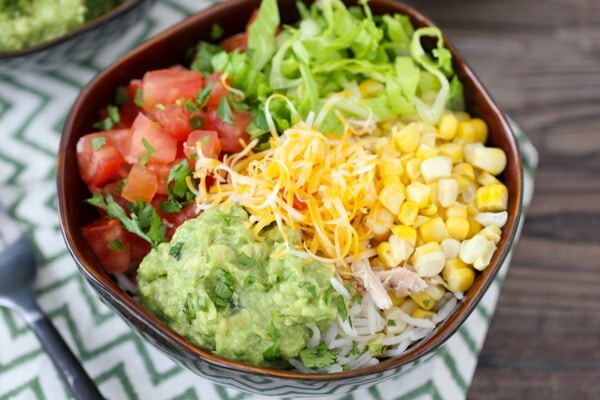 For the main entree, she served Homemade Burrito Bowls. What a brilliant idea! Everyone serves themselves a scoop of warm rice, tops it with their choice of meat (Marina had both pulled pork and pulled chicken in slow cookers as options) and then all of our favorite fresh toppings – lettuce, pico de gallo, guacamole, shredded cheese and sour cream. 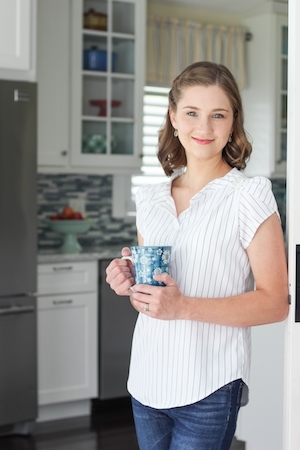 Not only is this such a perfect option for parties, but it’s also so handy for warm summer days. Season the chicken with salt and ground black pepper on both sides. Place in a 400 degree Fahrenheit preheated oven and roast for 35-45 minutes, until the chicken is cooked through, and the internal temperature reaches 175 degrees Fahrenheit. Set the chicken aside until it’s cool enough to handle. Take the skin off the chicken and tear the meat into bite sized pieces with two forks. Discard the skin and bones. You can also roast a bone-in, skin on chicken breast, just roast it until the meat reaches 165 degrees Fahrenheit. You can use any cooked meat that you like, like Pulled Pork, Pulled Beef, sautéed or grilled meat or chicken or even shrimp. You can sauté the meat in a skillet as well. Omit the meat completely to make this vegetarian. Instead of meat you can use beans, chickpeas, etc. 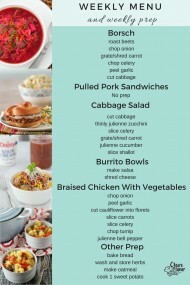 Using your crock pot is a great idea. You can use this recipe for Pulled Chicken. 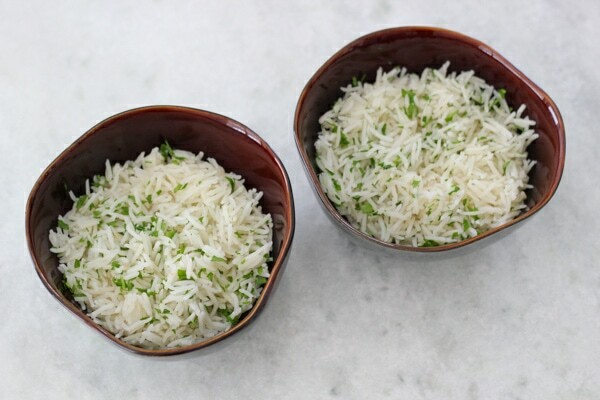 Prepare the Parsley Rice Pilaf by this recipe. Add parsley when the rice is cooked. You can use cilantro instead of rice and also add some lime juice. Sometimes I use brown rice instead of white rice and it’s just as delicious. 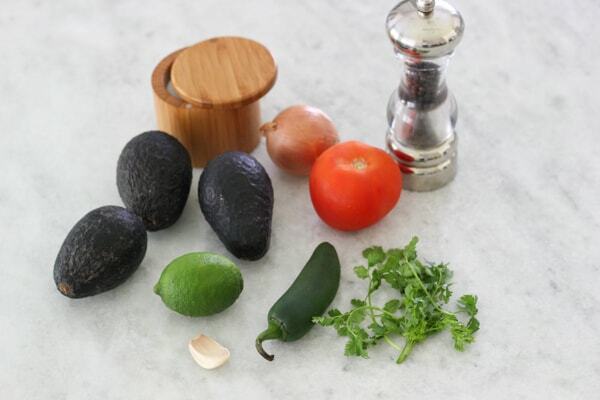 Prepare the Guacamole by mashing the avocado with a fork and adding the rest of the ingredients, except for the tomatoes, unless you are serving the guacamole immediately. If you make the guacamole ahead of time, cover it with plastic wrap, so that the plastic wrap lies directly on the surface of the guacamole. Guacamole will start to turn brown quickly, so by covering it with plastic wrap, you are preventing the oxidation. Add the tomatoes right before serving. The surface of the guacamole may turn brown, but as soon as you mix it up, it will be green again. I’ve also read that if you place the avocado pits into the guacamole, that will help prevent browning too. It was worth a try. 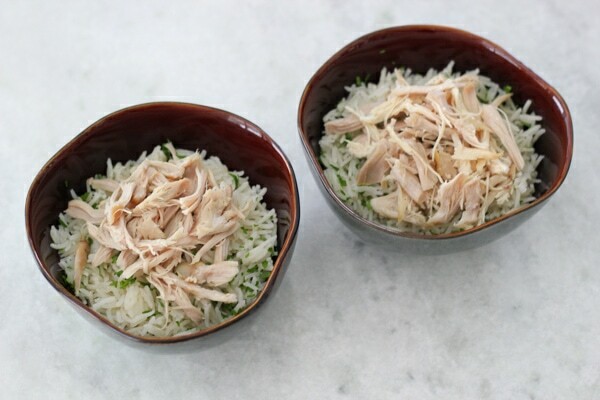 Serve the rice and chicken with all the toppings, letting everyone make a bowl with all the toppings that they like. Season the chicken with salt and ground black pepper on both sides. 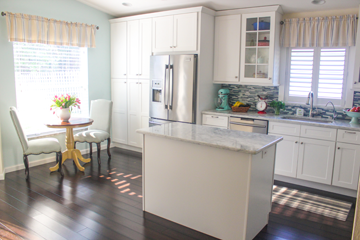 Place in a 400 degree Fahrenheit preheated oven and roast for 35-45 minutes until the chicken is cooked through, and the internal temperature reaches 175 degrees Fahrenheit. Set the chicken aside until it's cool enough to handle. 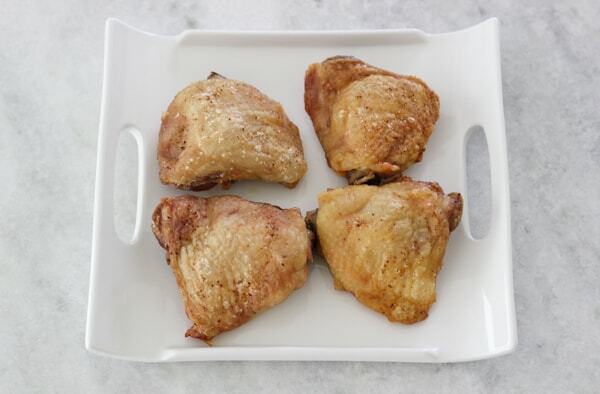 Take the skin off the chicken and tear the meat into bite-sized pieces with two forks. Discard the skin and bones. You can also roast a bone-in, skin on chicken breast, just roast it until the meat reaches 165 degrees Fahrenheit. You can use any cooked meat that you like, like Pulled Pork, Pulled Beef, sautéed or grilled meat or chicken or even shrimp. You can sauté the meat in a skillet as well. Omit the meat completely to make this vegetarian. Instead of meat, you can use beans, chickpeas, etc. 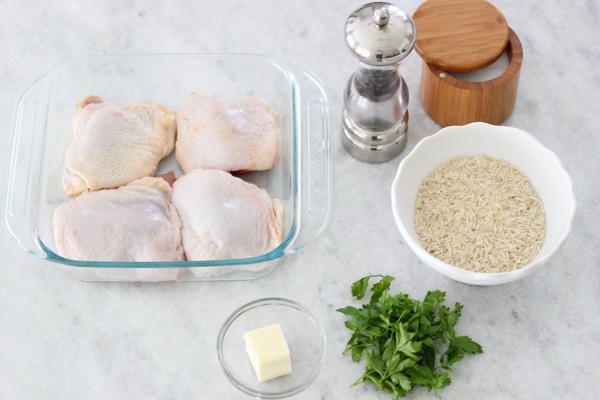 Prepare the Parsley Rice Pilaf. Add parsley when the rice is cooked. You can use cilantro instead of rice and also add some lime juice. Sometimes I use brown rice instead of white rice and it's just as delicious. 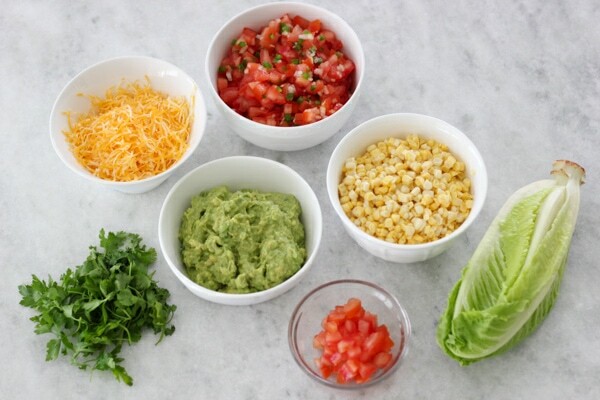 Prepare the Guacamole by mashing the avocado with a fork and adding the rest of the ingredients, except for the tomatoes, unless you are serving the guacamole immediately. If you make the guacamole ahead of time, cover it with plastic wrap, so that the plastic wrap lies directly on the surface of the guacamole. 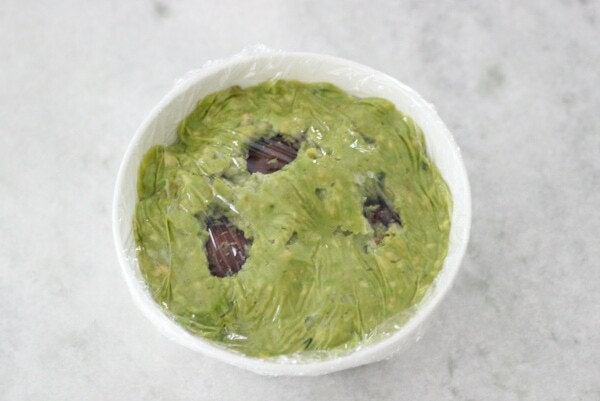 Guacamole will start to turn brown quickly, so by covering it with plastic wrap, you are preventing the oxidation. Add the tomatoes right before serving. 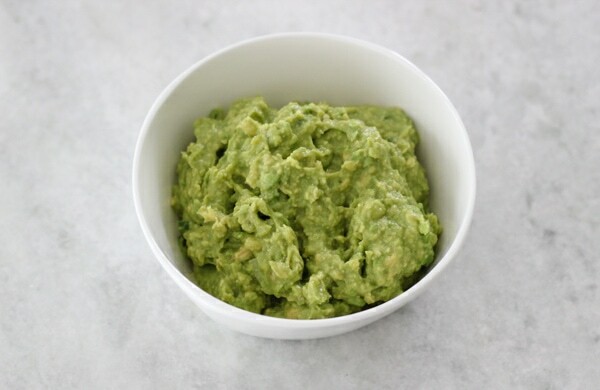 The surface of the guacamole may turn brown, but as soon as you mix it up, it will be green again. Thank you for wonderful recipe!! 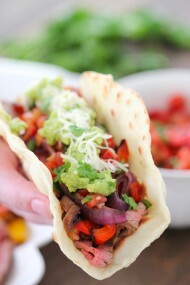 I should try it specially guacamole!! My fav!! By any chance you have on to do list carne asada fries from muchas gracias? 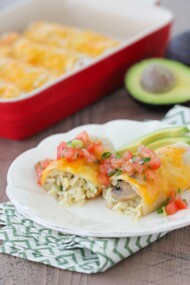 Hi Tanya, I’m glad this recipe caught your eye:). I’ve never had Carne Asada Fries. We don’t have a Muchas Gracias in our area, as far as I know. This looks so beautiful, healthy and colorful!